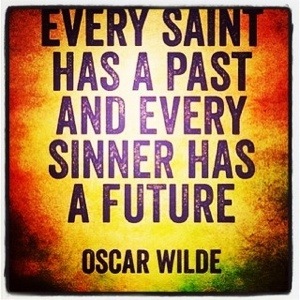 Saints, sinners, and how we can do our best. I often feel this way when I think about myself…my past…my mistakes…and how the world might define me. Do you ever wonder what people would think about you if they really knew you? The mistakes, the problems, the flaws. It still blows my mind when I think about the fact that God sees everything in the depths of my heart & soul. He sees the good, the bad, and the very ugly. Even so, He loves me. Even more? He believes in me and wants to put me to work for His kingdom. It’s hard for us to believe this, and to believe that we are ever good enough, pure enough, or qualified enough to do God’s will. Why? We spend so much time comparing ourselves to others. As a young woman, I know that’s something I struggle with. We look at the women who are married, patient, happy, cook like chefs, clean their homes with a smile on their faces, never lose their tempers, always have composure, and just seem “perfect”. Comparing ourselves to others never leads us more toward being godly women. If anything, it does the opposite. It creates bitterness, jealousy, frustration, and impatience. Also, these “perfect” women, these godly women who look incredible to us are still human. We all have flaws, we all fall short, and we all struggle. Often times, we judge others because their sin looks different than ours. But the point is, we all sin. Your friend who is the Christian-Martha Stewart-Betty Crocker is still just a human. And guess what? God doesn’t favor her. God doesn’t want her to build His kingdom more than you. He doesn’t praise her accomplishments more than yours. And He doesn’t cry more for her struggles and pains than He does for yours. We are all different. God created us as unique individuals. Your sin may not be the same as mine. Your strengths may not be the same as mine. I’m positive that our pasts as well as our futures look completely different. But our God doesn’t put crazy, unrealistic expectations on us. He simply wants each of us to do our own, individual, creative best. Stop looking at the girl next to you. Look at your heart and look at God. You are beautifully & wonderfully made. Do your creative best. Next postWho is writing your love story?